Welcome to Share Your Creations Party #27! I hope you will join in the fun! Sherry at Sherry's Bee's Nest painted this $4.99 bargain stool with her homemade chalk paint and stenciled "Relax" on the front. It turned out great! These night stands are such a pretty color. Visit Crafty In Canada to see the before and after. For my creation I thought I would show you this striped pillow I hot glued together. I know I'm crazy, but I didn't want to wait for one to be made and got impatient! I took took another pillow apart and used the monogrammed "B" and insert from it. I cut the striped fabric to go around it and carefully glued it together just as you would sew it and somehow it turned out ok. (just don't look too close) We might not want to have pillow fights with it though...it would definitely come apart! Ha! I love the stripes up against the floral pattern. Ok...so what did you create? I know it's got to be something better than a hot glued pillow! All I ask is that you add a link back to my blog so others can find the party. I finally finished my mantle yesterday...can you believe it? As you know I am doing some redecorating and adding in a little bit of that pretty blue color. It's not like I had enough color before huh? =0 While alot of people are neutralizing I am adding MORE color! Ha! Color just makes me happy. Anyway, it is a bit of a challenge adding in the blue. Of course one thing leads to another and there is more that is going to have to be changed than I thought. It's going to take a little more time to pull it all together. I have had my mantle basically the same since I moved in this house. It's still kind of the same, but at least I finally moved the dogs! I used the same oil painting I've always had up there. I just can't seem to find anything else right now. I did add a little paint to it that you will see below. You can see by my pillows how it's starting to come together. I found the vases at Hobby Lobby and doctored them up a bit with some paint to tone them down a little. I really like the color. I have had arrangements on this mantle since I moved in too. I just feel like I need the height and greenery and just keep changing them up. My mom knew I was adding in the blue and bought me this pretty bird picture at the Cracker Barrel. It inspired me to go with a bird theme for spring and summer. It's very subtle, but I added a little more blue in the clouds and flowers. I added grass, wheat, sticks and yellow flowers to the vases. I also dressed them up with ribbon and a blingy flower. I've had the yellow bird plates forever. The rest of the living room, dining room and kitchen are still a work in progress...but at least I accomplished one thing! I am finishing up custom orders, but should have some new things in my Etsy store by tomorrow night. Welcome to Share Your Creations Party #26! I hope you all are still out there...I have been a little crazy lately (nothing new =0) and just couldn't seem to get a post together since my last party. I also can't seem to get my house together! As you know I am doing a little redecorating. Well, all of a sudden I can't decide on anything! It takes time, money and effort to find just the right things. It will come together, I just have to be patient. Maria Elena at Our Home Away From Home re purposed her old drapes and made a coverlet for her bed. What an awesome idea! Martina at Northern Nesting added some wax covers and crystals to her chandelier. It turned out great and dressed it up just enough. 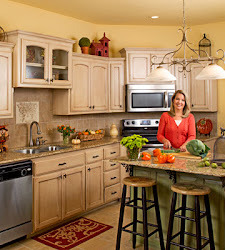 Here is another great recipe from A Pinch Of Joy. 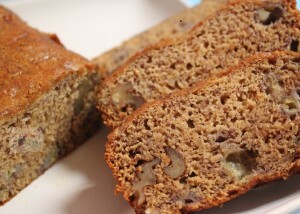 Honey banana bread...yum! For my creations I thought I would show you some things I am listing in my Etsy store. Get ready for spring with this bright and colorful bunny arrangement! It even has some of that pretty french script ribbon winded through it. A tin watering can always says "Spring". Do you see the pretty butterflies? This one is soft and airy with a nesting bird in the middle. It would blend with any spring decor. I've already sold alot of the bunny arrangements, but have plenty more! You can't see the container very well, but it has a butterfly on the front. This can be used at Easter and during the spring months. 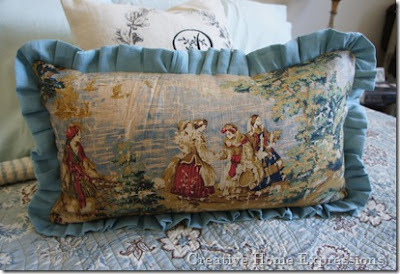 Kathy at Creative Home Expressions makes beautiful pillows. She sells them in her Etsy store along with tea towels, table runners and other pretties! Tami at Curb Alert hunts for treasures on the side of the road. She found two tomato cages and turned them into topiaries. Great idea! Since it was just Valentine's Day I had to post some of your pretty Valentine creations. 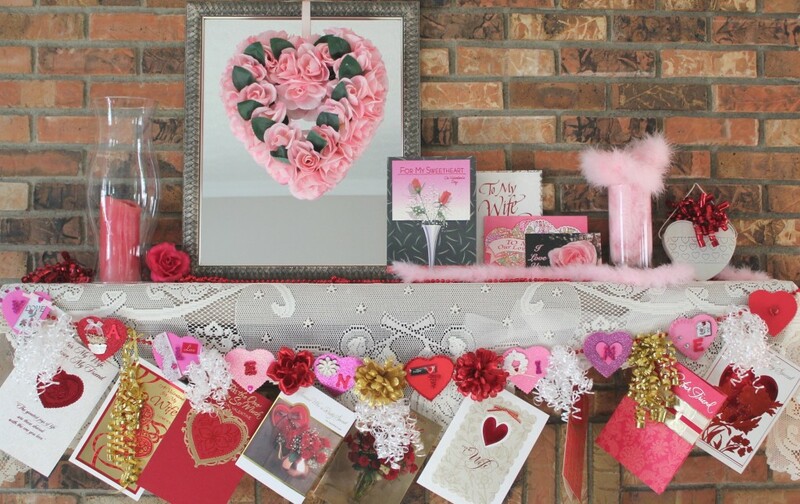 This romantic mantle was created by Charlene at A Pinch Of Joy. Sheila at Notesongs put her dainty fingers to work and made all of these cute heart and Scottie dog ornaments. Adorable!! Shenita at Embellishments By SLR put this tablescape together with items from the Dollar Tree. Very pretty and she only spent $10! I ordered the bird containers at market and they came in yesterday. 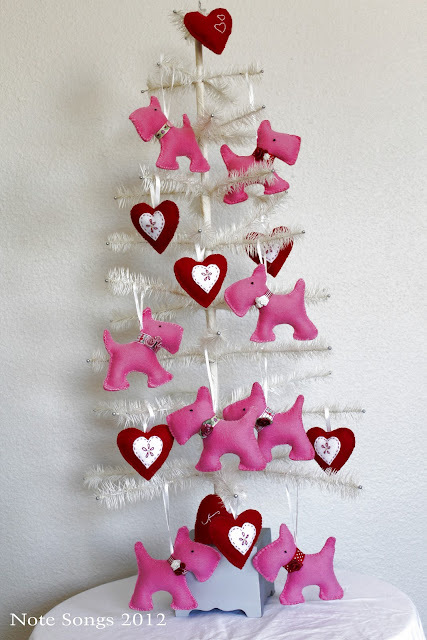 I do have more in different colors and they are beautiful! I am planning on selling them in my Etsy store if I can find boxes to ship them in. I didn't think about that when I ordered them...Anyway, I really didn't know where I was going to hang this but it sure looks good in the niche! I think I will leave it in here and possibly add something sitting below it. It might look better just by itself, I'll have to play around with it and see. The container also comes in red with a blue bird and off white with a yellow bird and pink flowers. I thought it would look good on a door too. I'll search for boxes and will hopefully have some listed in my store soon. I hope you all had a wonderful Valentine's Day! I just had to show you these pretty cupcakes Kevin brought home to me tonight. No, they are not diamonds...lol...we do not buy each other expensive gifts for Valentine's day or any day as a matter of fact! haha! However, I was so excited when he came through the door with these tasty treats. I have had some of each one and cannot pick a favorite, but the lemon raspberry was mighty tasty. However, my belly is not happy right now...not feeling so well. 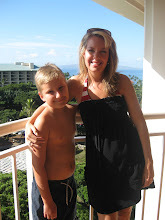 I hope you had a wonderful day!!!! Are you thinking spring yet? It was a little hard for me to make bunny arrangements while it was snowing outside today...but I enjoyed the pretty snow this morning. I'll have to say that although it has been a warm winter I am ready for the spring months to arrive. I can't believe it's the middle of Febuary already. Spring will be here before we know it! I have been listing new items in my Etsy store over the past few days. I have sold several, but am trying to keep as many things in my store as I can. I'll have to say that I am in love with this cute bunny...he is just so cute! This arrangement would look cute for Easter and the spring months. It would make a great centerpiece. 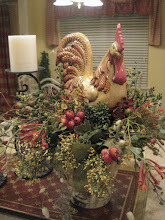 The next two arrangements are a little smaller, but would look cute sitting on a kitchen counter or maybe an end table. This arrangement has a pair of cute black and white bunnies surrounded by spring flowers and grass. This arrangement is done in a dragon fly container and is full of pretty yellow and white daisies. This arrangement could be used for everyday. 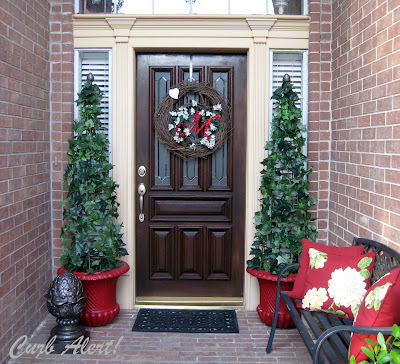 It has beautiful brick reds and gold colored flowers and berries. It would make a great kitchen or dining room centerpiece. This birdhouse arrangement is so bright and cheeful! It would make a wonderful centerpiece. It's made in a cute rabbit container. More items to come...click HERE to visit my store. I want to say that I'm sorry my blog has been so boring lately =0 Do you ever feel like you are running in circles trying to get things done? That's how I have felt lately. As you know I am working on adding some new decor to the living room, dining room, and kitchen but it's becoming a slow process. I am also still working on the craft room and it's just about done. I've also been busy with custom orders too...it just seems like there's not enough time in the day lately. I will have alot to show you soon, so don't give up on me! 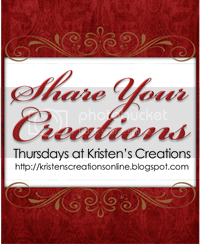 Welcome to Share Your Creations Party #24! I hope you will join in the fun this week...we all like to see what you are creating. Since it's so close to Valentine's Day I thought I would feature some of your pretty Valentine creations. I just LOVE this pretty Valentine mantle Amanda at My Heart's Desire created. It is just adorable! 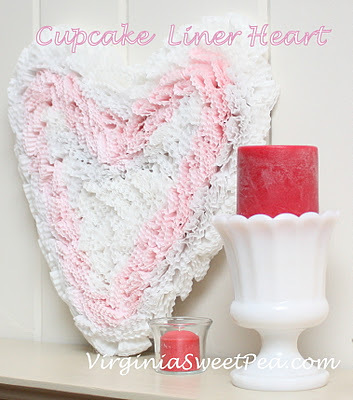 Paula at Sweet Pea created this heart using cupcake holders. How clever! Be sure and visit her for the tutorial. 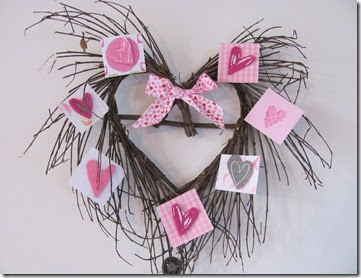 The Valentine heart door wreaths were created by Rhonda at Ramlings of a Southern Girl. They are adorable and look great with the pillows. This wreath by Two Succulent Sisters is made out of scrapbook paper and hearts glued on a heart shaped grapevine wreath. Cute! Here are a few of mine...I will be listing these frames in my Etsy store soon. Look at the pretty french script ribbon...I am loving it! My new stuff from market is coming in and I am so ready to create some new items!